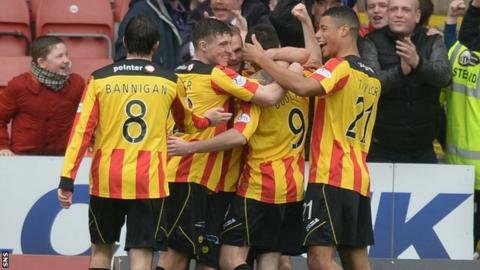 Partick Thistle manager Alan Archibald believes two wins from their last three games will keep his team safe from the threat of a relegation play-off. The Jags currently sit one place and one point above the dreaded 11th place. And Thistle are on the same points mark as Saturday's opponents Hibernian, who are eighth. "The way teams are cutting each others throats we know that with two wins and we'll be safe," Archibald told BBC Scotland. "Once you get that one win you can start looking up the way to try and get that seventh place." Thistle received a boost in the last couple of matches with a victory over Kilmarnock followed by a draw at home to St Mirren. Terry Butcgher's Hibs though are on a dreadful run of results of six straight defeats. They've gone 10 games without a win and have picked up only one win in their last 16 matches. "Every time you play away, you know there's going to be a noisy home crowd, " added Archibald. "The best thing to do is silence them and the best way to do that is by starting the game well and maybe try and get an early goal." "That's the plan away from home against any side and it will be the same against Hibs. "You will probably see a different Hibs. My players have been warned. There is nothing worse in football than a wounded animal. "When people keep on putting them down and putting them down, it gets a player's back up and the manager's back up. "We will be very aware that Terry will have them right up for it. "I was at the derby [Hibs' 2-1 defeat by Hearts] last week and they were probably the better team but they lost out to two set-plays. "I thought they came out with a great deal of fight and desire to try to keep their team in the league and I think they will show the same this week because everyone seems to be writing them off."